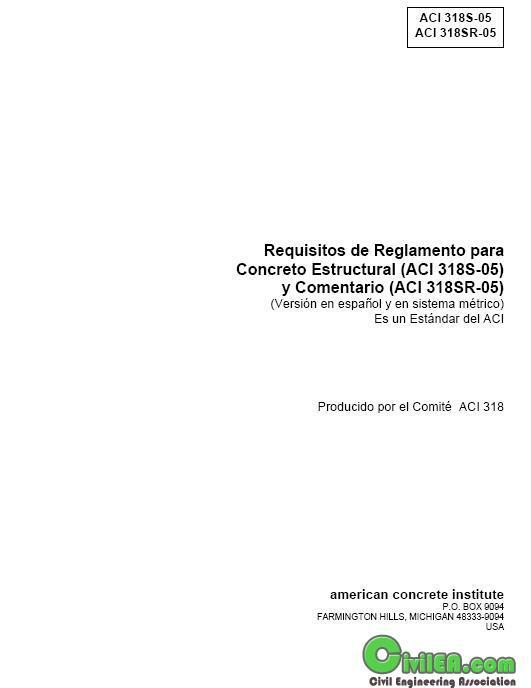 USA - ACI 318 S 05 for Structural Concrete- Spanish version. USA - ACI 318 S 05 for Structural Concrete - Spanish version. This regulation provides the minimum requirements for the design and construction of structural concrete elements of any structure built according to the requirements of general building codes legally adopted, which this regulation forms part. In places where you do not have an legally adopted building regulations, these regulations define the minimum acceptable provisions in the practice of design and construction. The 2005 regulation revises the earlier version of "Code Requirements for Structural Concrete (ACI 318-02)." This regulation includes in a single document the rules for all concrete used for structural purposes, including plain concrete and reinforced concrete both. The term "structural concrete" is used to refer to everything simple or reinforced concrete used for structural purposes. This covers the spectrum of uses of concrete structural concrete from the simplest to the reinforced concrete not prestressing with prestressing steel or composite sections with steel or pipes.